Joseph Maxwell died at home, surrounded by family, after a brief illness. He was 85. Maxwell was born in Boone County, Indiana, to Claude and Doris Riley. The family moved to California when he was 3 years old. On the way, a high fever led him into deafness. At the age of 6, he attended California State School for the Deaf in Berkeley where he graduated in 1954. He went to Gallaudet College, now University, in Washington, D.C. and graduated in 1959 with a degree in Physical Education. He joined a fraternity Kappa Gamma and participated in many sports, such as football and track. He earned a silver medal in the high jump at the 1957 Deaf Olympics held in Milan, Italy. He also met his wife, Sally, a fellow U.S. athlete, at the games. He started working at Kansas School for the Deaf as woodworking teacher and coached football as well as track for six years. In 1965, the couple moved to Falmouth, Maine, where Deaf School was on the island. 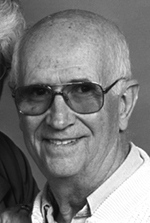 He taught woodworking and coached soccer and track from 1965 to 1978. While in Maine, the couple’s children, Janet and Don, were born. Maxwell built two houses in his time in Maine, one in Yarmouth and other was in Cumberland Center. Joseph and Sally moved to Oregon in 1978 where Joe taught physical education until 1992. He then transitioned to teaching health, math and driving education. He retired in 1994, after 35 years of teaching. Maxwell was preceded in death by his grandfather, his mother, father, stepfather, older brother, Claude, older sister, Juanita, sister, Carol, and son, Gary Lance. He is survived by his wife; his son, Don (Elize); his daughter, Janet; one granddaughter, Amanda; brother, Mel (Arlene); three sisters, Barbara, Rosie (Ken), Ellen; and many nephews, nieces and cousins. According to his wishes, no services are scheduled, but a Celebration of Life will is slated for April 7 at the Oregon School for the Deaf cafeteria in Salem from 1 to 4 p.m. In lieu of flowers, the donations are requested for: Office of Development, Gallaudet University, 800 Florida Ave NE, Washington, D.C. 20002 in the name of Joseph W.R. Maxwell. and Oregon Association of the Deaf, P.O. Box 8054, Salem, Oregon 97303. Earmarked for any Deaf Oregonian, that has goals to go to the Deaf Olympics in the name of Joseph W. R. Maxwell.